crinklynose.com: Is that a Bone??? 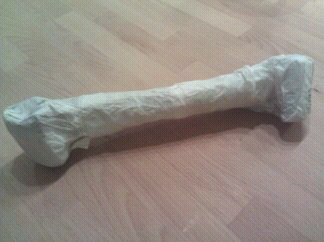 When I picked up my daughter from school last Friday, she was uberly excited to show me her craft for the day (human bone made out of paper) Lesson plan for the month is all about human body including skeletal system so I had a pretty good idea why they have bones for this week's craft. She was like "Mommy, look it!" (Showing me the bone paper mache she did). Me: "Wow, that's awesome! Good job!" Unbelievable! Wow!!! Toddlers these days know these kinda stuff?